The 555 CMOS Timer is the central piece of the Hulda Clark Zapper. The 555 has a small round cookie bite at the top. If you look at the photo above you can see the small dot near the top left corner of the 555. The little dot is next to Pin 1, and it designates the top of the timer. 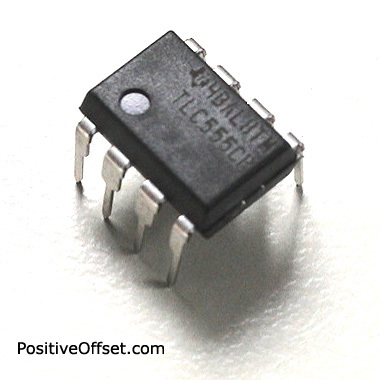 When one is using a 555 CMOS Timer in a circuit, one must first establish the top of the timer so that it is built into the circuit correctly. The 555 CMOS Timer is vulnerable to static electricity. If you walk on a carpeted floor and the 555 receives a static shock it may burn out and need replacement. Save time and shipping by ordering extras.